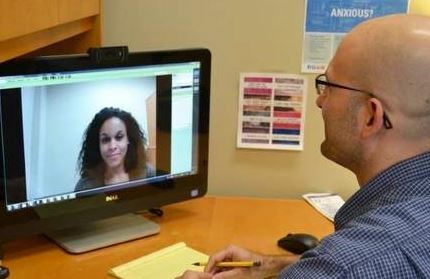 The University of Florida’s Counseling & Wellness Center has launched a novel program that provides therapy to patients with anxiety disorders — all over a computer screen. The Therapy Assisted Online (TAO) program, started in the fall, has had staggering results, showing that it is, so far, more successful than individual or group therapy sessions offered face to face. Sherry Benton, director of the UF Counseling & Wellness Center, said that when she computed the results, she was so shocked she had to take a walk. “I think my counseling staff are still in shock,” she said. Benton explained that the counselors weren’t changing what they were doing between their already-effective face-to-face sessions and the online ones. TAO is a seven-week program that consists of modules completed by the patient, coupled with a weekly 10- to 12-minute video conference with a counselor and a smartphone app with homework and reminders. Benton said each week builds off the one before it, starting with a patient learning how to observe his or her own anxiety, working on living day to day, then working on facing their fears until all of the steps can be put together. Benton said she thinks the success of the program comes from how integrated it is in a patient’s life. “When you’re at individual or group therapy, you’re thinking about it when you’re there, but not so much the rest of the week,” she said. “When online, you have materials to deal with wherever you are, whenever you need it.” She said it is also successful because it is more than just self-help and utilizes counselors to aid patients with what is working and what isn’t. “If it was self-help, I think people would drop out,” she said. Dr. Geoff Lee, counselor at the wellness center and one of the primary forces behind the program, said much of the success comes from the fact that college students like to be self-directed and feel in control. “Students like to feel like they are solving their own problems,” said Lee, who is one of 12 counselors seeing patients through the online therapy. Benton said the program was started when the wellness center realized that no matter how many new counselors it hired, the counselors wouldn’t be able to get to the bottom of the wait list to get counseling. So the center looked out of the country, to Europe and Australia, where they were treating anxiety online. She said the wellness center then built its own program, which now is being requested by other campuses in the state. Because the program is unique, Benton said she hopes it gets out to other universities. She said the demand for therapy is a national problem, and this might be a solution. She said the program could provide therapy not just to the affluent who can afford it but to a much larger clientele. “I think we’ve created something pretty amazing,” Benton said. The plan for UF’s program, Benton said, is to expand it to other areas of need. She said an online depression or trauma treatment program might be in the works and that the center hopes to double or triple the number of students using the program. If a student is interested in trying the online anxiety treatment, call the UF Counseling & Wellness Center, which is located on Radio Road, at 392-1575 and ask for a TAO triage.